Farmhouse placed on two floors surrounded by a land of 5 hectares of woodland and olive grove that are part of the property. The farmhouse is located at 400 meters above sea level in a panoramic position and isolated but a few minutes by car from the town and the main services. On the ground floor, kitchen with external veranda, double living room overlooking the portico with a view of the Valdichiana, double bedroom with a cradle and a bathroom. Also on the ground floor there is an outdoor room with an antique wood oven for baking bread and barbecue. Upstairs there are three other bedrooms including one with a double bed, one bedroom with three single beds and one bedroom with two single beds, lounge with original antique fireplace and a bathroom. The swimming pool is in exclusive use and is open from April to the end of October. The house is ideal for 10 people. In the winter period will be charged in addition to the price of the stay the costs for the ignition of the radiators if necessary. The costs for hot water, electricity, Wi-Fi and final cleaning are all included in the price of the stay. 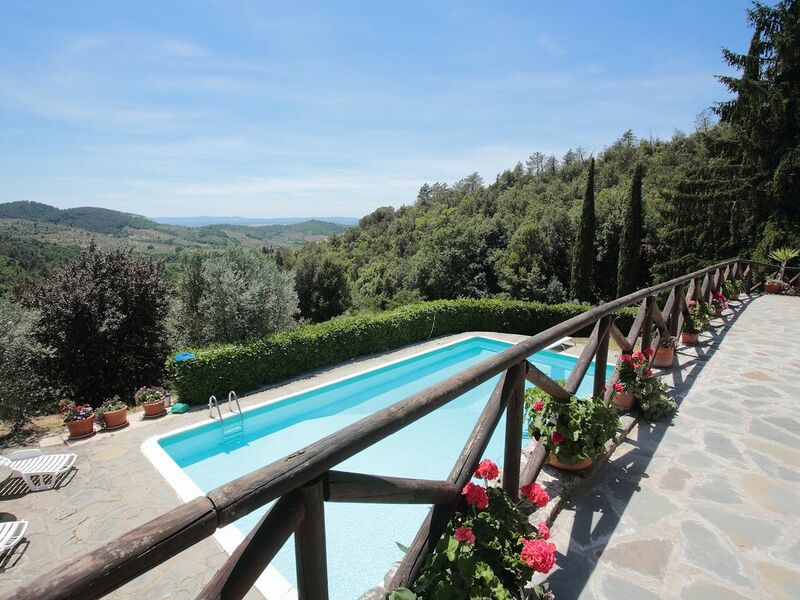 This lovely old farmhouse is surrounded by hectares of olive groves & woodland with panoramic views across rural Tuscany featuring beautiful sunrises & sunsets. It’s hidden away up an incline off the road terminating in the small village of Ristonchia, so no through traffic makes it secluded and peaceful. A standout feature of the farmhouse is its generously sized pool which is well kept by a maintenance man and a pool cleaning robot. It isn’t heated so was a bit cold on some days in September. The shallow end is perfect for children and less confident swimmers, while the very deep end is lovely for diving & floating. There’s lots of indoor & outdoor space including dining room, two lounge areas and outside eating area. Calling the farmhouse “ideal for 10 people” is perhaps a bit of a stretch. It could accommodate two families with children with its two double rooms (one with a cot), two twin rooms (with quite small beds) and two bathrooms. The beds aren’t the most comfortable (the four poster is split into two single mattresses). The kitchen and downstairs bathroom are a little dated and we missed having a kettle. The upstairs bathroom was very nice but the bath could do with a shower screen. We were met by the non-English speaking maintenance man, who came daily to tend to the pool; we were otherwise given complete privacy. The host lives away so we did not meet him in person, but he was available and responsive by WhatsApp. Being in the middle of the countryside there are plenty of creepy crawlies around. The small lizards and butterflies are fascinating to watch. We rescued a few frogs from the pool. We did find a couple of scorpions indoors but the only creatures that really bothered us were wasps who were trying to nest in one of the parasols by the pool and pestered us constantly. The host was responsive in trying to deal with the problem. The nearest town is Castiglion Fiorentino which is a walled town with narrow streets full of shops, cafes, restaurants and a museum. We particularly recommend Ristorante Da Muzzicone for truffles & steak. There are also nearby wine producers offering tours and wine tasting. Nestled in the middle of Tuscany, you’re well placed to explore the walled towns of Arezzo to the North and Cortona to the South and drive through the scenic Val di Chiana and Val d’Orcia. Siena and Florence also within fairly easy reach and Lake Trasimeno and Assisi are just across the border in Umbria. We had a wonderful stay from the moment we arrived and were met by Vincenzo's mother - Maria, who welcomed us and showed us around, to the moment we reluctantly left 4 weeks later. The house is situated high in the hills, the location and views are incredible. The house itself is a true renovated Tuscan farmhouse, with some original features retained and was a delight to stay in. Many days spent relaxing by the pool, which is kept in pristine condition by Duoro, who visits daily very early in the morning so as not to disturb anyone. Duoro was also on hand to keep us supplied with local wine and to immediately sort out any minor issues. We had Raffaella, a local lady, come to the house twice to cook us traditional Tuscan food; a wonderful experience and shouldn't be missed. Many evenings we drove into the nearby town of Castiglion Foirentino, walking through the narrow streets and calling into the bars and we had a memorable meal at Da Muzzicone. Vincenzo is a great host and always responded quickly to any questions we had and suggested places for us to visit. We would definitely highly recommend this place to anyone looking to stay in Tuscany. Our first time in Italy and what a first impression. Vincezo's Villa is gorgeous. Spacious well equipped and clean. The views are stunning and the pool was well used. In all we spent 10 days here and can honestly say it's one of the best holidays I've had. Cortona and Assisi are a must to visit, along with Florence, although take the toll road to the tram stop just north of Florence and tram in, so much easier. We spent 2 fantastic weeks here with our large family, and would have happily stayed longer! The views from the Villa were breathtakingly beautiful - to wake up and see that every morning was a blessing. Olive groves, countryside and sky - so much sky!! The Villa was very comfortable, well equipped and full of Rustic Charm, and came with Wi-Fi and Netflix. Vincenzo was a very attentive and helpful owner, who was available at any time and responded immediately to any enquiries. His mother met us at the Villa and was lovely, we were provided with a sample of their beautiful Extra Extra virgin Olive oil, which was INCREDIBLE and some local wine which was also delicious. The Pool is as amazing as the photos suggest - we spent every day diving and cooling off in there - very well maintained. Amenities, local supermarkets and restaurants are just a short drive away - we had some lovely meals in Castiglion Fiorentino with amazing views over looking the hills and town below - oh and the Gelato is simply SCRUMMY!!!! Would certainly recommend and would love to return for another amazing adventure - thank you Vincenzo! This is a lovely large rustic farmhouse which is well equipped and furnished even with wifi and smart TV if needed but this is not why you would come here. The views from the house are astounding and uninterrupted .The terrace and outdoor veranda are wonderful places to enjoy eating or playing games day or night. The pool is excellent ,clean and well maintained with a splendid diving board to add to the fun. We managed to find hillside tracks for walking and also off road cycling close to the house and local towns like Cortona are only 20mins drive away . Vincenzo is a friendly and helpful owner and his mother who greeted us is a lovely and informative lady ,she even took us to a local wine producer down the road where we purchased excellently priced and tasting white and red wine. We are large family of 7 with a dog and this house accommodated us well , I cannot fault this lovely property ,location or stay in any way , and would highly recommend. Prachtig gelegen en ideaal om zuid-Toscane, noord-Umbrië te ontdekken. Ook Castiglione zelf is meer dan de moeite waard om meermaals te bezoeken. Leuke accomodaties voor kinderen en volwassenen, alsook qua restaurantjes. 1800 farmhouse, panoramic location, 1 km away from Ristonchia, Castiglion Fiorentino's hamlet. It is surrounded by woods and olive groves, immersed in the silence of Valdichiana's hills.